Chinese Purple is a very unusual garlic in several ways. First, the bulb wrappers have vivid purple stripes on a very white background. Secondly, there is a strong tendency for these softnecks to produce a hardneck and the bulbil capsule at the top of the scape has a very definite turban shape to it. Thirdly, the clove covers are dark brownish-purple. Chinese Purples have a very strong garlic taste with a fierce heat. I privately call them Chinese cherry bombs as the heat is instantaneous and they seem to explode in your mouth. They have a strong aftertaste that sticks around for a while. While they are not the most powerful garlic I have ever tasted, they are one potent package. I perspired so much when I taste tested this one that it took 30 to 40 minutes for the hair on the back of my neck to begin to dry out. If you like strong garlic, this is one to get. 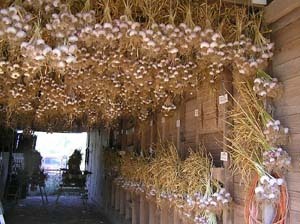 This would be an excellent garlic to use for the medicinal benefits or if you want an extra strong garlic to use in insecticide or anti-bacterial sprays as it would seem to have a very high potential to produce lots of allicin. Asaiatics and Turbans are always the first garlics we harvest each year as they the appear to mature before any of the others. Another surprise is the bulbs are much larger than you would think as you look at the size of their foliage. When you see them growing in the garden among other types of garlic, their leaves are not nearly as large as the others and you begin to think they aren't going to form very big bulbs, but the bulbs are surprisingly large. They store clean but they don't store as long as most other artichokes as they seem to want to get back into the ground earlier in the fall since they mature so early in the spring. Our Chinese Purple garlics average about 12 cloves per bulb in a fairly circular configuration.